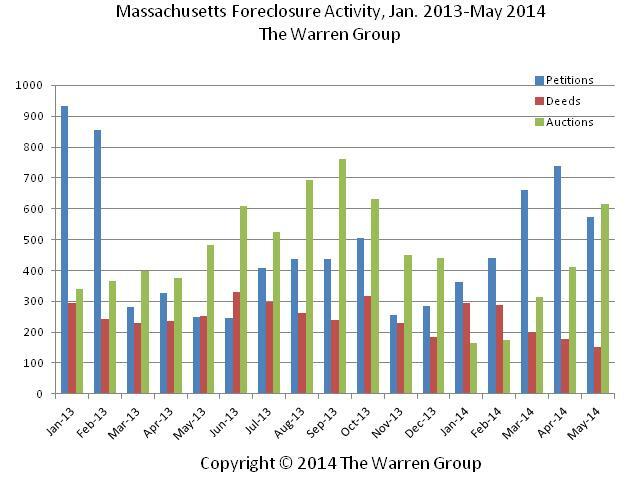 BOSTON, July 1, 2014 – Bay State foreclosure starts increased again in May with petition filings rising by 131 percent, according to The Warren Group, publisher of Banker & Tradesman. This marks the third consecutive month petitions have increased year-over-year. Petitions mark the first step in the foreclosure process. A total of 573 petitions to foreclose were filed statewide in May compared to 248 starts filed last year. Through May of this year, petition filings increased by 4.8 percent with filings totaling 2,776 compared with 2,648 filed during the same time period last year. Foreclosure deeds, which represent completed foreclosures, dropped almost 40 percent to 151 in May from 251 in May 2013. A total of 1,107 foreclosure deeds have been recorded in the first five months of the year, down 11.3 percent from 1,249 a year earlier. The number of advertised auction notices also increased in May. There were 616 auction announcements in May, up 27.8 percent from 482 a year ago. This marked the second consecutive month of increases in auction activity year-over-year. Year-to-date auction notices are down 14.3 percent – declining to 1,679 from 1,960 last year.